In one of the opening public lectures of the London School of Economics (LSE) 2010 term, Steve Ballmer , CEO of Microsoft, spoke on Seizing the opportunity of the Cloud: the next wave of business growth during which he kicked-off the one-hour packed session (between 8.30 & 9.30 am and we were there by 8 am!) on October 5, 2010 by talking animatedly about cloud computing , Windows Phone 7, to be launched on Monday in London and also ran a video of Kinect , the group’s soon-to-be released motion-sensing controller, for Xbox 360 in November 2010. “Our industry is going through quite a wave of invention, powered by one major phenomenon… the shift to the cloud.” He further mentioned “The two things that are absolutely clear about the Cloud is that the Cloud will open up a whole new range of opportunities to use computing in more valuable ways; a whole new set of opportunities for people to go out and build companies and make money off of the back of their creativity around information technology. The Cloud will certainly do that. The Cloud will certainly also bring with it a new set of responsibilities in terms of security, privacy and data availability, because as soon as you start pooling computing and data in new and interesting ways, really defining and really being careful about weighing up who owns what data and how it is controlled and used is a fundamental responsibility of every participant in that chain.” Further he added “The ability to use the Cloud as kind of a virtual computing resource in which scientists can literally share one another’s data, share one another’s results and have access to the kind of computing resources which no one scientific enterprise would be willing to stand up but in aggregate could come together to allow people to model and conduct many more experiments in the virtual world than anybody could ever run in the physical world is a real opportunity – is a real opportunity – and one certainly our company, through our high performance computing work, is pursuing today is. People will tell you that scientists tend to be a little bit more proprietary about their data so I am not going to say it is a linear path, but without the technology to enable it, it is kind of an idle philosophical discussion. Now we reach a point where the technology will really permit what I think is a very, very powerful new opportunity. So I am particularly excited about the kinds of new opportunities presented by the Cloud”. Asked about piracy in China–the world’s largest and most populous country– Ballmer said the Chinese government must step-up its enforcement of copyright laws, noting piracy in China is eight times worse than piracy in India, and 20 times worse than in the U.S.
Not all the questions were serious though, with one person asking Ballmer what his favorite game on Xbox was? His answer, “beach volleyball baby”, was met with much laughter. Ballmer also said tablet-style computers with Windows will be out by the year end. Considering the widespread perception that Microsoft is in decline – its stock was recently downgraded to neutral by Goldman Sachs – this event became a missed opportunity to present cogent reasons why Microsoft’s prospects are stronger than they appear, or to clarify the company’s strategy from cloud to device, in front of some of the UK’s most influential academia and press. For those of us who are not too familiar with Steve Ballmer, I feel we must know about him! Variously described as ebullient, focused, funny ,passionate, sincere, hard-charging and dynamic, Ballmer has infused Microsoft with his own brand of energetic leadership, vision and spirit over the years. 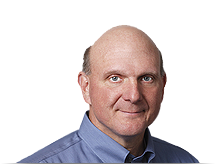 Ballmer was born in March 1956, and grew up near Detroit, where his father worked as a manager at Ford Motor Co. He graduated from Harvard University with a bachelor's degree in mathematics and economics. While in college, Ballmer managed the football team, worked on the Harvard Crimson newspaper as well as the university literary magazine, and lived down the hall from fellow sophomore Bill Gates. After college, he worked for two years at Procter & Gamble Co. as an assistant product manager and, before joining Microsoft, attended Stanford University Graduate School of Business. Steve joined Microsoft in 1980 as the first business manager hired by Bill Gates. Since then, Ballmer's leadership and passion have become hallmarks of his tenure at the company. Ballmer and the company's business and technical leaders are focused on continuing Microsoft's innovation and leadership across each of the company's core businesses. 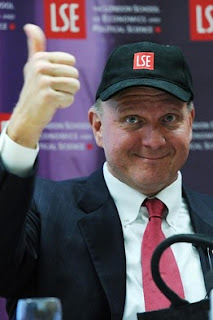 Ballmer is the second person after Roberto Goizueta to become a billionaire in U.S. dollars based on stock options received as an employee of a corporation in which he was neither a founder nor a relative of a founder. Ballmer is the 33rd richest person in the world according to Forbes, with an estimated wealth of $14.5 billion. While CEO of Microsoft in 2009, Ballmer earned a total compensation of $1,276,627, which included a base salary of $665,833, a cash bonus of $600,000, no stock or options, and other compensation of $10,794.